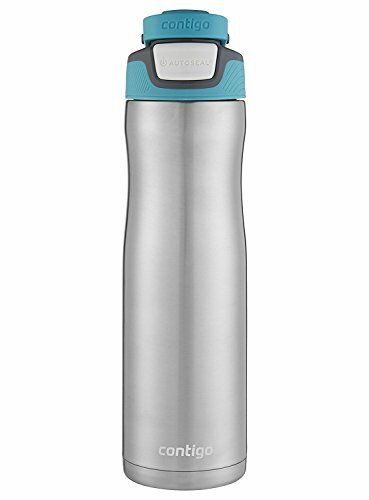 Literally keep your cool all day with the Contigo AUTOSEAL Chill Vacuum-Insulated Stainless Steel Water Bottle, 24 oz. Whether you’re running around town or on the treadmill, your water will stay cold up to 28 hours thanks to THERMALOCK vacuum insulation. Press the AUTOSEAL button to drink and release to seal after every sip. With AUTOSEAL technology, this reusable, BPA-free water bottle is leak- and spill-proof. When you’re done hydrating, flip down the integrated spout cover to help protect mouthpiece from dirt and germs. The lid also has a conveniently integrated carrying handle for easy transport from car to yoga class. At the end of the day, throw the lid onto the top rack of your dishwasher for an easy cleanup, but remember to hand-wash the stainless steel body.